A 100-win season hangs in the balance tonight. The Yankees had the third best record (100-62) and fourth best run differential (+182) in baseball in 2018, but, because the Red Sox had a historic season, the Yankees will play in the winner-take-all AL Wild Card Game tonight. Bummer. That 100-62 record is the best for a wild card team in the Wild Card Game era. I’m weirdly zen about all this. I’m sure I’ll be a wreck as we get closer to first pitch. Right now? I’m keeping it together. Here are some thoughts going into tonight’s do-or-die game against the Athletics. 1. 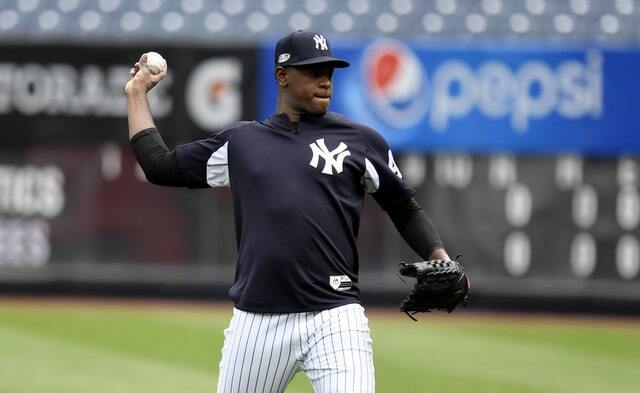 The Yankees announced yesterday that Luis Severino will start the Wild Card Game, and the more I thought about it the last few days, the more I realized Severino should get the ball. I know the Athletics demolished him in Oakland last month (six runs in 2.2 innings), but I keep coming back to something David Cone has been saying: When you have a Ferrari, you don’t leave it in the garage. Severino is a Ferrari. It’s elite level stuff and, even with his second half skid, he’s been one of the top pitchers in MLB the last two years. It’s the same logic behind starting Gary Sanchez. In a winner-take-all situation, you put the game in the hands of your best players, and trust them to do what’s necessary to win. I know Severino has not been first half Severino since, well, the first half. And I know he got lit up in the Wild Card Game last year. He’s a year older now though, and more experienced, and I think that experience will help him. It can be so easy to overthink something like this. Sometimes you just have to shut your brain off, take a step back, and look at the big picture. Severino is far to talented too avoid in a game of this magnitude. That is a few too many deep fly balls for me. Without the late night marine layer lingering over the Oakland Coliseum, Happ probably doesn’t have as much success. The Athletics hit fewer ground balls (39.7%) than any other team in baseball this season — they were years ahead of everyone else on the launch angle thing — and Happ is not a ground ball pitcher (40.1%). Sending him out there in Yankee Stadium against a righty heavy lineup loaded with fly ball hitters seems like bad news. As for Tanaka, he again posted MLB’s highest chase rate (40.7%) this year and also one of the highest home run rates (1.44 HR/9). The Athletics had the lowest chase rate in the league (27.6%) and the third highest home run total (227). To have success, Tanaka has to get hitters to chase out of the zone and limit mistakes out over the plate. 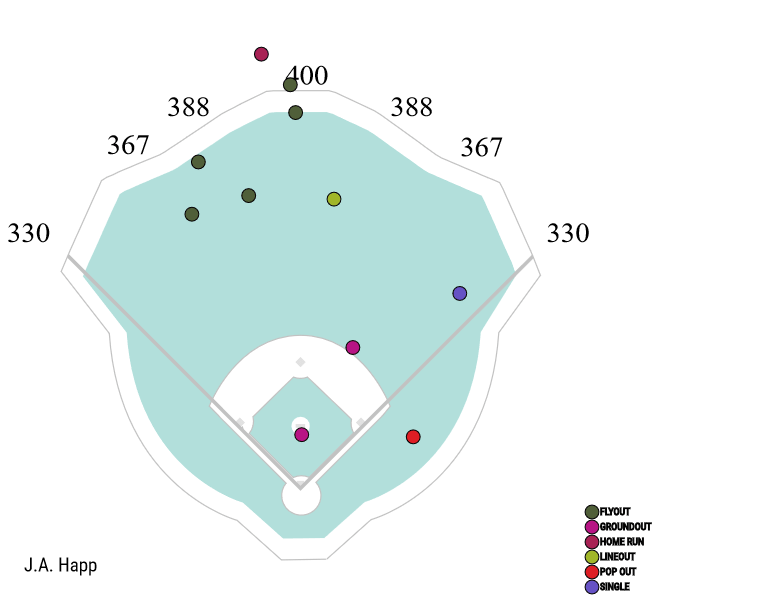 The A’s appear to be a team that could give him trouble by not chasing out of the zone, and having the ability to hit any mistakes a mile. Beyond the whole “Severino is your most talented pitcher” thing, the case can be made Oakland’s lineup is particularly well-suited to face Happ and Tanaka. Either way, no matter who starts, I suspect the bullpen will be called into action at the first sign of trouble. 3. The first sign of trouble. I’ve been saying that a lot lately. “The bullpen will be active at the first sign of trouble.” What does that mean, exactly? Is the first sign of trouble a leadoff single in the first inning? A run allowed? Long at-bats that result in outs on hard-hit balls? I’m not sure what qualifies as the “first sign of trouble” and there’s probably no definitive answer to this. Chances are the Yankees will observe the game, read the pitcher, read the swings, and react accordingly. And that might mean sticking with a pitcher with two men on base after a borderline 3-2 pitch goes for a walk and a little nubber off the end of the bat turns into a ground ball with eyes. Based on the bullpenning hype and what I saw in our comments (RIP) and what I see on social media, my sense is that if Severino is left in long enough to allow two home runs and three runs and put runners on second and third with one out like he did in the Wild Card Game last year, Aaron Boone is going to get absolutely skewered. Joe Girardi had a short leash with Severino in last year’s Wild Card Game. Looking back at it, you almost wonder why Severino’s leash was that long. I feel like the expectation is Boone will have an even shorter leash this year. I foresee a lot of *runner reaches base* “get the bullpen up!” commentary on the way. I’m not sure how realistic that is. 4. My hunch is that, unless the Yankees get seven innings from Severino or something like that, Chad Green will be the first guy out of the bullpen. Regardless of situation. Clean inning, men on base, whatever. Green made 63 regular season appearances this year and 21 times he entered the game in the middle of an inning with runners on base. Considering the Yankees had the highest bullpen strikeout rate (30.2%) in baseball history this season — they’re the first team ever with four relievers with 90+ strikeouts (Green, Dellin Betances, Aroldis Chapman, David Robertson) — they were pretty crummy at stranding inherited runners. The bullpen allowed 32% of inherited runners to score this year. The league average was 31%. Green allowed 35% of inherited runners to score this season and was better than Betances (38%) and Robertson (37%). Jonathan Holder was at 34% and Chapman only entered the game in the middle of an inning with men on base five times. It’s not something he does often. My preference would be Robertson in the fireman role, though my opinion is jaded after seeing him do the Houdini thing so many times. Green and Robertson have essentially identical inherited runner strand rates (35% vs. 37%) and strikeout rates (31.5% vs. 32.2%). I’m not sure there’s a meaningful difference between the two in a fireman situation, meaning entering a game with runners on base in the middle of an inning. Green’s been throwing the ball very well lately — he struck out ten of 19 batters faced in his final five regular season appearances — and he might be the best bet to get the Yankees out of a jam at the moment. Saturday’s appearance was a good test for Chapman. He entered in the middle of an inning with men on base — again, he didn’t do that often this season — and got the strikeouts to end the inning. It was also the ninth inning, his usual inning, and it was a save situation. I think the Yankees want Chapman to be their closer in the postseason the same way I think they wanted Severino to start the Wild Card Game. That’s their preference. We know Chapman can pitch the ninth inning and close out big games in October. We saw him do it last year. The question is just his knee and whether he’s where he needs to be after missing a month. Chapman got rocked in his first game back. In his final four games though, he threw 3.2 hitless innings and struck out eight of the 13 batters he faced. My gut says Chapman is the closer tonight. 6. Tonight’s game has a chance to turn into a Home Run Derby. The Yankees led baseball in home runs this season and the Athletics were third. Yankee Stadium gives up a lot of homers. A lot. Also, the postseason ball was extra juiced last year. A record number of home runs were hit last postseason and several pitchers complained the ball was different. Specifically, it was extra slick, which made breaking balls a challenge, and also allowed the ball to travel further. (I suspect the same ball was used in the homer happy All-Star Game this year.) Two home run reliant teams in a home run ballpark with a possibly juiced baseball could get very interesting tonight. I like the Yankees chances against any team in a home run filled slugfest. But yeah, don’t be surprised if tonight turns into dinger city. 7. Guess I have to make a prediction, right? My predictions last year were pretty good! Not perfect, but in the ballpark. I had the Yankees rallying to win the Wild Card Game following an early Eddie Rosario two-run homer. That happened! I had the Yankees coming back from down two games to one to win the ALDS, which, technically, they did. (Don’t ask about my ALCS prediction.) For this year’s Wild Card Game, I’m thinking low-scoring game despite the home run potential. I’m going to say the Yankees win 3-2 in a game with zero homers. Zero. That feels like a very baseball thing to happen. American hero Luke Voit gets The Big Hit™ — I’m thinking a go-ahead two-run double in the sixth — and New York’s bullpen overwhelms the A’s. So there you have it, folks. No reason to watch tonight now.